Xscape Yorkshire01977 664 794work Theme ParkXscape Yorkshire is the ultimate family day out destination with a variety of leisure activities, places to eat and specialist outdoor brands. From skiing, sledging and rock climbing to trampolining, laser tag and adventure golf, Xscape is bursting with all your favourite pastimes as well as something a little more adventurous. Guaranteed non-stop fun for everyone. Xscape Yorkshire is the ultimate family day out destination with a variety of leisure activities, places to eat and specialist outdoor brands. From skiing, sledging and rock climbing to trampolining, laser tag and adventure golf, Xscape is bursting with all your favourite pastimes as well as something a little more adventurous. Guaranteed non-stop fun for everyone. 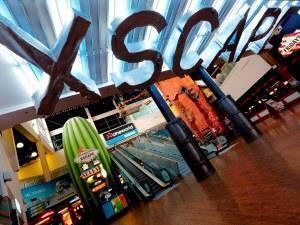 Xscape is open 264 days a year, 6:30 – 23:30. It’s free to visit Xscape, attraction prices vary – see website for details.